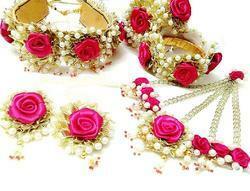 Providing you the best range of yellow flower gota patti jewelry set, red rose multi strand flower jewelry, red rose mogra flower jewelry necklace, pink blue gota patti bangles for women & girls, green flower gota patti bracelets with ring for women & girls and gota patti earrings with maang tika for women & girls with effective & timely delivery. 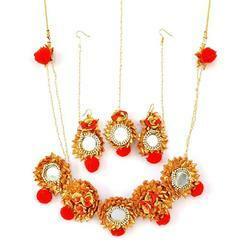 Ambika Designs to match your beauty and clothes which gives you an equisite and fashion look. 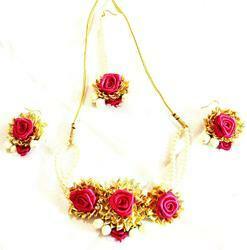 Material & Craft: Handcrafted necklace, earrings and mang tika made of pearls, foam mogra and flowers. Occasion: Suitable for wedding, engagement, graduation , party prom, and any event to look beautiful. 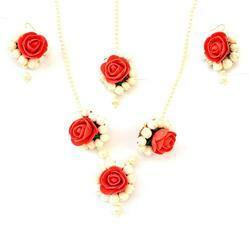 Colour: Off white pearls, red flowers and white mogra. Disclaimer Ambika Designs is the authentic and trusted brand for jewellery worldwide. Please be aware of fake products. 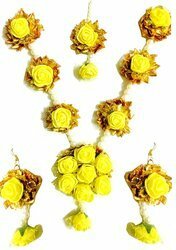 Red Rose Multistrand Flower Jewelry Set With Earrings & Maang Tika For Women & Girls Ambika Designs to match your beauty and clothes which gives you an equisite and fashion look. If you purchase from any other seller selling our products or giving offers on our listing is solely your risk. Many of our customers faced skin problems, marks and rashes by ordering jewellery from these fake sellers and they reported this matter to us. Ambika Designs is the authentic and trusted brand for jewellery worldwide. Please beware. 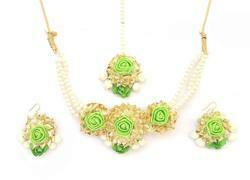 Ambika Designs is the one-stop-destination for the finest flower jewellery in India and overseas. Here, we believe that jewellery need not come with heavy price tags but with exceptional quality and durability. We are extremely happy to be serving thousands of customers across India and satisfying them with our unique designs that are not available anywhere else. Also, each jewelry is made very light weight so that you can wear it for hours. Each piece at Ambika Designs pass through 10 hands for quality check before it gets delivered at your doorstep. Our team based in Rajasthan beautifully carves the metal, kundan, beads, pearls in Rajasthani colors and polish them with a touch of legacy and royalty. 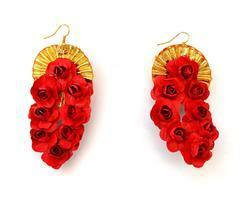 Ambika Designs is the one-stop-destination for the finest flower jewellery in India and overseas. Here, we believe that jewellery need not come with heavy price tags but with exceptional quality and durability. We are extremely happy to be serving thousands of customers across India and satisfying them with our unique designs that are not available anywhere else. Also, each jewelry is made very light weight so that you can wear it for hours. Each piece at Floret Jewellery pass through 10 hands for quality check before it gets delivered at your doorstep. Our team based in Rajasthan beautifully carves the metal, kundan, beads, pearls in Rajasthani colors and polish them with a touch of legacy and royalty. If you purchase from any other seller selling our products or giving offers on our listing is solely your risk. Many of our customers faced skin problems, marks and rashes by ordering jewellery from these fake sellers and they reported this matter to us. Floret Jewellery is the authentic and trusted brand for jewellery worldwide. Please be aware. 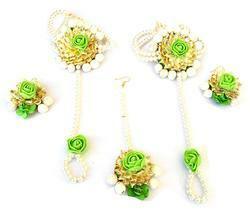 Best quality and light weight flower jewellery for women. 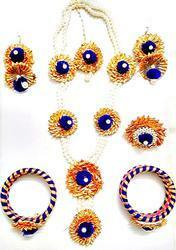 Ambika designs collection is inspired from the latest jewelry trends. We focus on giving supreme quality to customers. Packaging- Fancy Jewellery BoxFloret Jewellery is the one-stop-destination for the finest flower jewellery in India and overseas. Here, we believe that jewellery need not come with heavy price tags but with exceptional quality and durability. We are extremely happy to be serving thousands of customers across India and satisfying them with our unique designs that are not available anywhere else. Also, each jewelry is made very light weight so that you can wear it for hours. Each piece at Floret Jewellery pass through 10 hands for quality check before it gets delivered at your doorstep. Our team based in Rajasthan beautifully carves the metal, kundan, beads, pearls in Rajasthani colors and polish them with a touch of legacy and royalty. 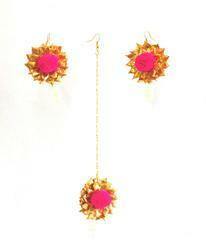 Party Wear Gota Patti Magenta Flower Jewelry Maang Tika Earring . If you purchase from any other seller selling our products or giving offers on our listing is solely your risk. Many of our customers faced skin problems, marks and rashes by ordering jewellery from these fake sellers and they reported this matter to us. the authentic and trusted brand for jewellery worldwide. Please beware. Jewellery collection is inspired from the latest jewelry trends. We focus on giving supreme quality to customers. the one-stop-destination for the finest in India and overseas. Here, we believe that jewellery need not come with heavy price tags but with exceptional quality and durability. We are extremely happy to be serving thousands of customers across India and satisfying them with our unique designs that are not available anywhere else. Also, each jewelry is made very light weight so that you can wear it for hours. Each piece at pass through 10 hands for quality check before it gets delivered at your doorstep. Our team based in Rajasthan beautifully carves the metal, kundan, beads, pearls in Rajasthani colors and polish them with a touch of legacy and royalty. 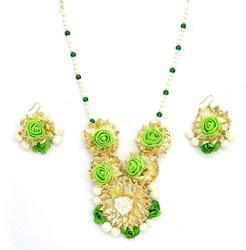 Best quality and light weight jewellery for women. Disclaimer: If you purchase from any other seller selling our products or giving offers on our listing is solely your risk. Many of our customers faced skin problems, marks and rashes by ordering jewellery from these fake sellers and they reported this matter to us. Ambika Designs is the authentic and trusted brand for jewellery worldwide. Please be aware. is the one-stop-destination for the finest in India and overseas. Here, we believe that jewellery need not come with heavy price tags but with exceptional quality and durability. We are extremely happy to be serving thousands of customers across India and satisfying them with our unique designs that are not available anywhere else. Also, each jewelry is made very light weight so that you can wear it for hours. Each piece at pass through 10 hands for quality check before it gets delivered at your doorstep. Our team based in Rajasthan beautifully carves the metal, kundan, beads, pearls in Rajasthani colors and polish them with a touch of legacy and royalty. 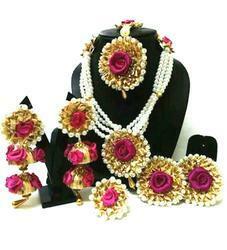 Floral design to match your beauty and clothes which gives you an equisite and fashion look. 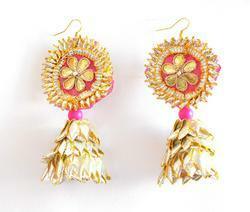 Material & Craft: Handcrafted earrings and mang tika made of foam flowers, pearls and gota flower. 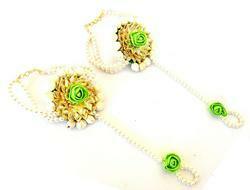 Colour: Off-white pearls, yellow foam flowers and golden gota. Disclaimer: Floret Jewellery is the authentic and trusted brand for jewellery worldwide. Please be aware of fake products. Design: Floral design to match your beauty and clothes which gives you an equisite and fashion look. Disclaimer: If you purchase from any other seller selling our products or giving offers on our listing is solely your risk. Many of our customers faced skin problems, marks and rashes by ordering jewellery from these fake sellers and they reported this matter to us. is the authentic and trusted brand for jewellery worldwide. Please beware. 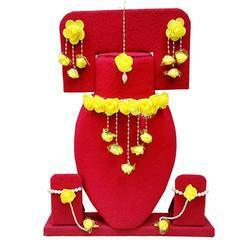 Ambika Designs Yellow Color Gota Patti Necklace, Earrings, Haath Paan with Set . If you purchase from any other seller selling our products or giving offers on our listing is solely your risk. Many of our customers faced skin problems, marks and rashes by ordering jewellery from these fake sellers and they reported this matter to us. is the authentic and trusted brand for jewellery worldwide. Please beware. collection is inspired from the latest jewelry trends. We focus on giving supreme quality to customers. If you purchase from any other seller selling our products or giving offers on our listing is solely your risk. the one-stop-destination for the finest flower jewellery in India and overseas. Here, we believe that jewellery need not come with heavy price tags but with exceptional quality and durability. We are extremely happy to be serving thousands of customers across India and satisfying them with our unique designs that are not available anywhere else. Also, each jewelry is made very light weight so that you can wear it for hours. Each piece at Eminent jewel pass through 10 hands for quality check before it gets delivered at your doorstep. Our team based in Rajasthan beautifully carves the metal, kundan, beads, pearls in Rajasthani colors and polish them with a touch of legacy and royalty. loral design to match your beauty and clothes which gives you an equisite and fashion look. 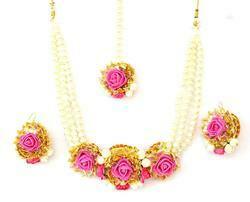 Material & Craft: Handcrafted necklace and earrings made of very soft wool, pearls and gota flowers. 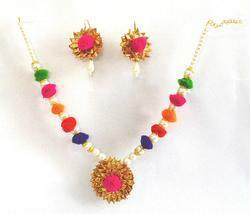 Colour: Multicolour wool, off white pearls and golden gota give it very soothing and adorable look. Disclaimer:Ambika Designs is the authentic and trusted brand for jewellery worldwide. Please be aware of fake products. 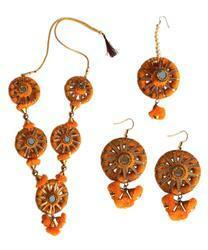 Ambika Designs is the one-stop-destination for the finest Ambika Designs in India and overseas. Here, we believe that jewellery need not come with heavy price tags but with exceptional quality and durability. We are extremely happy to be serving thousands of customers across India and satisfying them with our unique designs that are not available anywhere else. Also, each jewelry is made very light weight so that you can wear it for hours. Each piece at Floret Jewellery pass through 10 hands for quality check before it gets delivered at your doorstep. Our team based in Rajasthan beautifully carves the metal, kundan, beads, pearls in Rajasthani colors and polish them with a touch of legacy and royalty. 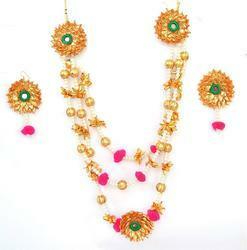 Ambika Designs Pink Gota Patti Jewelry Necklace With Mang Tika & Earrings Set . Many of our customers faced skin problems, marks and rashes by ordering jewellery from these fake sellers and they reported this matter to us. Ambika designs is the authentic and trusted brand for jewellery worldwide. A traditional ensemble, this jewellery set includes 1 necklace, 1 maang tika, 1 pair of earrings, 1 pair of bracelets and 1 ring. 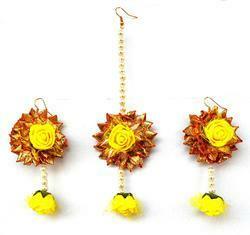 It is usually worn by the bride during her haldi or wedding ceremony. 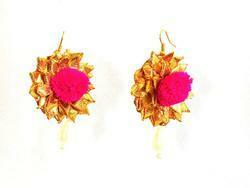 Material & Craft: Handcrafted earrings made of gota flowers, pearls and wool pom pom. 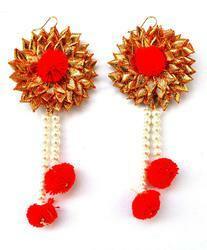 Colour: Off-white pearls, red pom pom and golden gota flower. Ambika Designs is the authentic and trusted brand for jewellery worldwide. Please be aware of fake products. 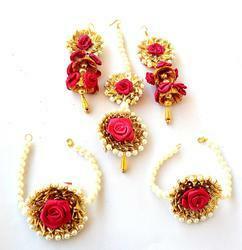 Ambika Designs is the one-stop-destination for the finest flower jewellery in India and overseas. Here, we believe that jewellery need not come with heavy price tags but with exceptional quality and durability. We are extremely happy to be serving thousands of customers across India and satisfying them with our unique designs that are not available anywhere else. Also, each jewelry is made very light weight so that you can wear it for hours. Each piece at Ambika Designs pass through 10 hands for quality check before it gets delivered at your doorstep. Our team based in Rajasthan beautifully carves the metal, kundan, beads, pearls in Rajasthani colors and polish them with a touch of legacy and royalt .